Texas coach Charlie Strong says he never worried about losing the team. 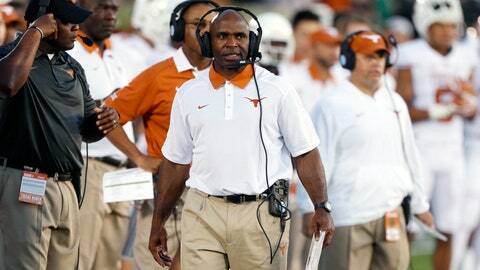 When it appeared Charlie Strong’s program was coming apart from the inside-out after the embarrassing loss at TCU that led to players sniping at each other in the media and on Twitter, Strong said he never worried that he was losing the team. The win at the Cotton Bowl against Oklahoma proved his team had always bought into his program, he says. "The players have bought in," Strong said Monday during his weekly press conference as Texas prepares seeks its first consecutive wins of the season when it plays host to Kansas State on Saturday in Austin. "I was never concerned about them. When you have a win like that, where you sit on the edge of everything, to have a win like that trying to get over the hump, now that it has happened, you just hope the confidence builds on and on." Despite how dysfunctional things appeared from the outside, with freshman defensive back Kris Boyd tweeting during halftime of the TCU game, with the upperclassmen and underclassmen seemingly going after one another, Strong said on the inside he never believed the team was fraying. Now that Texas has had a a week to let the emotions settle from the roller coaster that has been the Notre Dame blowout, the change in quarterback and play-caller, the consecutive gut-punch losses to Cal and Oklahoma State, the TCU debacle and then the OU euphoria, Strong still isn’t sure which Texas team will show up against a Kansas State squad that nearly upset TCU weeks ago only to get crushed 55-0 to OU last week. Strong said he cautioned his team not to pay attention to that score because the Wildcats can bounce back just as Texas did against the Sooners. "I wish I had that answer for you," Strong said about how he expects his team to play Saturday. You’re right, it’s just — you’d like to develop some consistency and hope that you gain momentum and you just continue to improve and get better and better. Now with this week off, now you’d love to continue to play so that now you have a little momentum, just continue to play on. But you know, we had to get them ready and had to have a game plan where we can go and execute a game plan and where you have some success executing it."